Fatigue is seen as significant contributory factor to many incidents in shipping industry. And the aim of the rest hour requirements is to avoid or minimise fatigue. But compliance with rest hours requirements has become the seafarer’s worst nightmare these days. Not only you and your ship staff need to be well rested each day but you also need to prove it to the authorities. 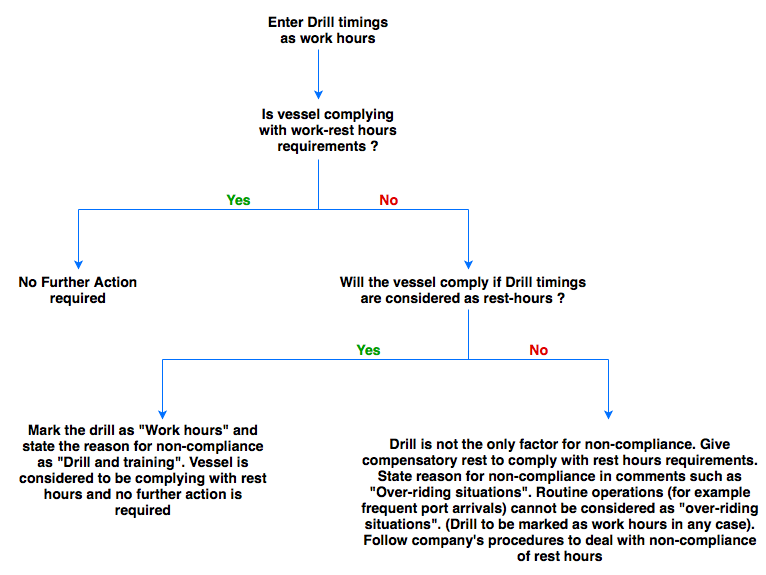 Mind you, regular non-compliance with the work and rest hours requirements can be the reason enough for the detention of the vessel by port state controls. The best way to avoid this nightmare is by understanding the rest hours requirements. What complicates it further is that we had multiple regulations stating the same requirements but in the slightly different way. OPA-90 requirements for work and rest hours. Thankfully after Manila amendments to STCW code, the STCW 2010 requirements are made in line with the MLC requirements. Now, all we need to worry about is to comply with one requirement and others will be complied automatically. OPA-90 requirements are for crew working on tanker vessels trading in US waters and these still have slightly different requirements than STCW and MLC. For understanding the work and rest hours requirements, I will focus on STCW requirements in this article. STCW Chapter A-VIII/1 (Fitness for duty) defines the work and rest hours requirements. Let us understand each point of the regulation one by one. The first requirement about the rest hours is to have a minimum of 10 hours of rest in any 24-hour period. Let us say below are the work and rest hours for 1st of a month for a seafarer. Does this comply with the 10 hours rest in any 24 hours period? Yes, of course !!! In this day the seafarer has got the rest from 0000-0600 hrs and then 2000-2400 Hrs amounting to 10 hours. But there is more to this requirement than it meets the eye. Let us say next day this seafarer came to work at 0500 Hrs and knocked off at 1000 Hrs. After that, he was off for the full day. Does it still comply with 10 hours rest requirement? No, it does not comply now. Why? The requirement is for 10 hours of rest in ANY 24 hour period. I can choose any 24 hour period and check if he got 10 hours rest in that period or not. In this case, I choose 24 hour period from 0600 Hrs on 01st day to 0600 Hrs on the next day. Count the rest hours in this 24 hours period. It comes out to be 9 hours only. So in this 24 hour period, he got total rest of 09 hours only and would not comply with the 10 hours of rest requirement. The takeaway point is that the word “any” is important in this requirement. This is similar to the earlier requirement we discussed but it takes into account the rest in 7 days period. The word “any” is again important in this. The 7 days period is not necessarily from midnight to midnight. It can be any time of any day and 7 days period thereafter. So I can choose 0900 hrs on 2nd May to 0900 Hrs of 09th May. Or I can choose from 1200 Hrs on 12th May to 1200 hrs on 19th May. Irrespective of which 7 days period I choose, the rest hours need to a minimum of 77 hours. We need to have at least 10 hours of rest in any 24 hours, that’s OK. But we need to have some hours of continuous rest too. If a crew is made to work on 3 hours on- 3 hours off basis, he would not be considered as sufficiently rested even though he gets 12 hours of rest in 24 hours period. The second requirement is that the “rest may be divided into no more than two periods”. For example, the 10 hours rest in a combination of 6+2+2 hours will not work. This will be the violation of rest hours requirements. But then what about 6+4+2? In this case, the rest hours are divided into three parts. Does it still comply with the work and rest hours STCW requirements? Yes, it does. The requirement is about dividing the minimum 10 hours of rest into no more than two periods. Any rest hours above that will not violate the maximum two periods requirement. The more simple way to say this is “a seafarer shall not be put to work continuously for more than 14 hours”. If the condition of 10 hours of rest in any 24-hour period is satisfied, this condition will be satisfied automatically. Let us say a crew’s work schedule is from 0600 Hrs to 2000 Hrs each day. This schedule would comply with 10 hours requirement as well as break up of these 10 hours requirement. It does not comply with 77 hours requirement in any 7 days period. The exception allows this work schedule to continue but it has three conditions. First, the rest period should not be less than 70 hours in any 7 days. 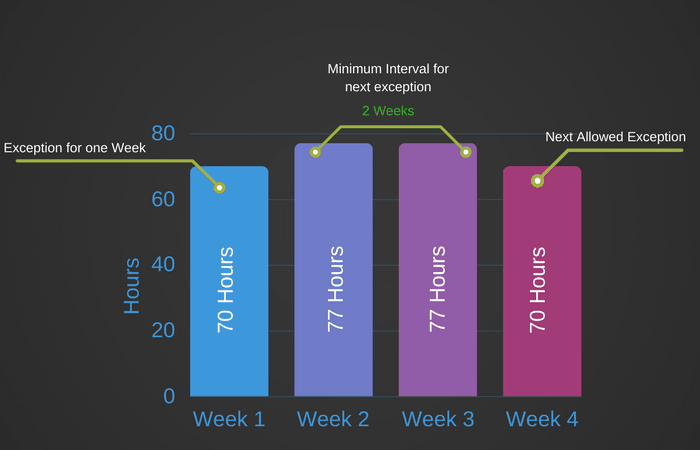 So in our example, it would comply with this requirement as the rest hours in 7 days period is not less than 70 hours. Second, this exception is not allowed for more than 2 weeks. So for our example, this schedule can continue till 14th of month. For the third week (14th to 21st), the rest need to be not less than 77 Hours. And the third condition is, the interval between two periods of exceptions shall not be less than twice the duration of exception. So if the exception was used for one week, the next exception can only be after two weeks. 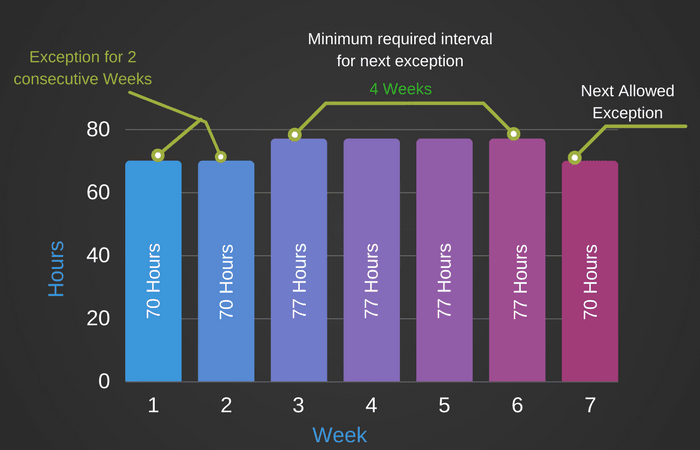 And if the exception was used for consecutive two weeks, the next exception can only be after 4 weeks. As we discussed, this exception cannot be used for more than two consecutive weeks. STCW provides the exception from the requirement of dividing 10 hours of rest in no more than two periods, one being not less than 6 hours. But this exception can only be used for maximum of two times in any 7 days period. Again the word “Any” is important in “any 7 days”. Let us say this is the rest hours break up of one crew in a 7 days period. 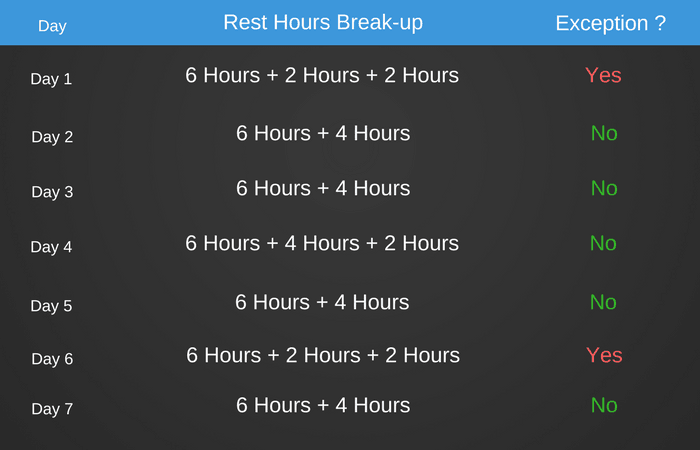 As we can see, the exception to divide the 10 hours of rest in 3 periods has been used twice. So this is fine. But if it was used for three times in this 7 days period, it would be the violation of rest hours requirements. The break-up for day 4 will not be considered as dividing the rest hours in 3 parts because 10-hours of rest has been divided in two parts. The next 2 hours of rest can be considered as extra rest and not part of 10 hours of rest. 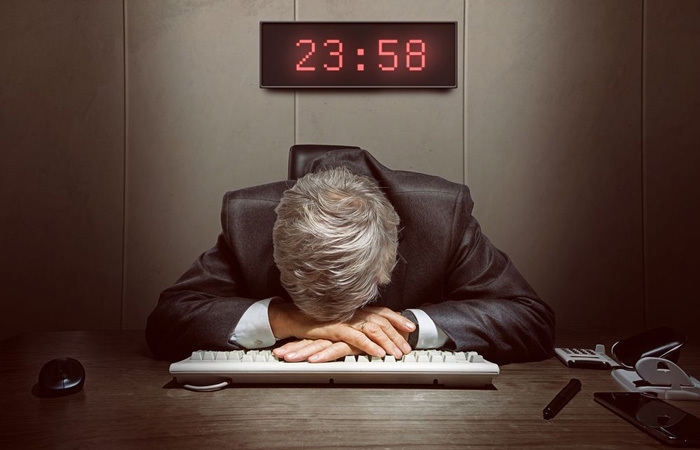 One of the most frequently asked questions about rest hours requirements is, “if the time spent during drills will fall under rest hours or work hours? Here is what you need to know about time spent during drills. This time needs to be entered as “work hours” but for the compliance with the rest hours requirements, it will not be counted as work hours. Let us say this below are the work hours for one crew for a day which includes drill from 1700 to 1800 Hrs. 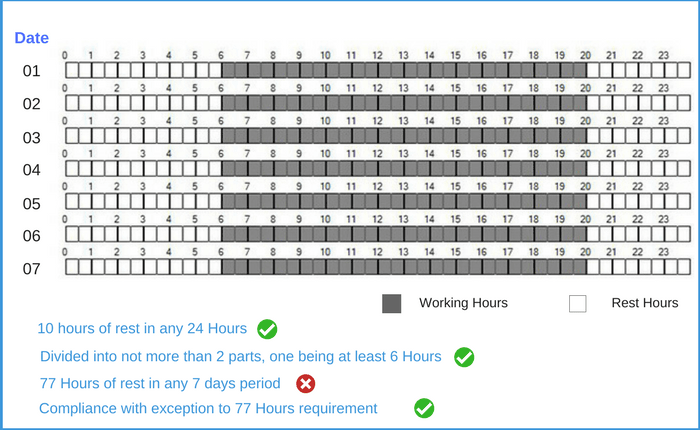 Even after showing drill timings as ‘work hours”, we are complying with the Work & rest hours requirements. But let us consider these rest hours timings for two days, say 19th and 20th Dec 2017? The drill was carried out on 19th Dec 2017 between 1800 Hrs to 1900 Hrs. Is the ship complying with work and rest hours requirements? No. Because if we consider 24 hours period from 0800 hrs on 19th Dec, there are only 9 hours of rest. But what if we consider the drill timings as “period of rest”. You will see that in this case, we will comply with rest hours requirements. The point I am trying to make is this. We need to mark the drill as work hours but for calculation of compliance with work and rest hours, we need to consider this as rest hours. The below flow chart can make this little easier to understand. We have discussed the STCW requirements for work and rest hours. These need to comply with at all times. Even if sometimes these cannot be complied with, the exception to these rules can be allowed as per the STCW requirements. But it will be the violation of STCW and MLC if the rest hour requirements are not met even after the allowed exceptions. Master and department heads need to be proactive in assessing the situation and must know about any situations that would lead to non-compliance with rest hour requirements. When identified, the master needs to act and allow the required rest to the concerned crew. If it requires the master to delay the berthing of the vessel, the master must not hesitate. But what if the non-compliance has already resulted and was identified only after it had happened. In this case, the company’s procedure for dealing with rest hours non-compliance need to be followed. To avoid the issues with “port state control” in future, it is advised to make a Non-conformance report” with corrective and preventive action taken. The company should send this to flag to close the matter. This NCR and response from flag can then be attached to the rest hours. The STCW rest hours requirements are complex. If I give a weekly rest hours sheet of a crew involving various activities such as port arrivals and departures, it will not be easy for you to check if this complies with all the requirements. That is where rest hours software comes handy. Most of the companies have provided a software on board to help master and officers check compliance with the crew rest hour requirements. The most used software in the industry is ISF Watchkeeper. 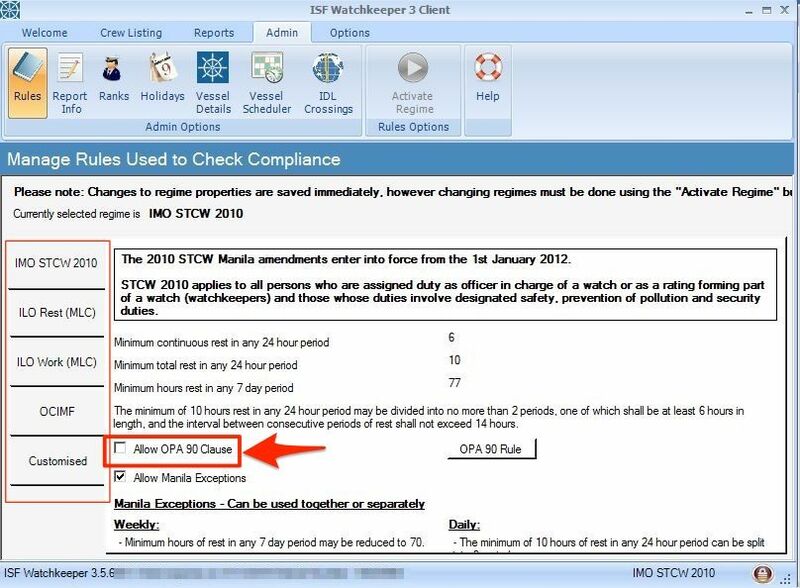 The best part of this software is that it takes into account all the regulations related to work and rest hours. For example when in US waters, the crew of the tanker vessels also need to comply with OPA-90 requirements of work and rest hours. In ISF watchkeeper, the Master (with admin password) can check the OPA-90 option and it will check the compliance with these requirements. Fatigue has been identified as one of the major factors in maritime incidents. This makes it so much important to address this issue and to ensure that seafarers working on ships are not fatigued. Work and rest hours requirements set a regulatory framework for the minimum rest hours each seafarer need to be provided. STCW 2010 also provides some exception to these two important requirements. It is the duty of the master and department head to ensure that there is no non-compliance with the rest hours. If any non-compliance is identified, the company’s procedures must be followed to deal (and close) with such non-conformance. Excellently explained. Appreciate the slides you have made to explain it. So much easier to understand. In the class we were told that after you have taken 2 weeks consecutive exemptions, then before you get into the next exemption, you have to take permission from Flag state. Wanted to confirm with you if this is so?? Also if a PSCO boards vessel just after vessel has berthed and ask for the work and rest hours in the last 24 hours of the crew member who was at the gangway and if it does not comply, then can we apply the not more than 2 exceptions per week in this scenario to get away with this observation?? If 2 exceptions have been used, next exception can be after 4 weeks. In this case, there is no need to take permission from flag state. We cannot take permission from the flag if we want to have the exception before 4 weeks in this case. There is no provision that allows violating the rest hours requirements with flag state permission. If we see that rest hours may not comply today or next day, we need to stop (anchor) the ship. Role of the Flag state would only come if some violation has already happened and it was realized later after it had happened. The company can inform the flag state of preventive actions taken to avoid issues with any PSC. regarding the second query, yes we can apply the allowed exceptions. DEAR SIR,GOOD DAY.VERY EFFECTIVE EXPLANATIONS.I LIKE TO READ YOUR WRITING TO ENRICH MY KNOWLEDGE. COULD YOU PLEASE EXPLAIN ME HOW TO MAINTAIN WORK AND REST HOUR IF CREW WORKING SIXES(6 ON AND 6 OFF). SAY IF PORT STAY FOR 7 DAYS THEN WORK HOUR EQUAL 84 HRS HENCE EXCEED 72 HRS.HAND OVER AND TAKE OVER WATCH 15 MINUTES BEFORE HENCE LESS THAN MINIMUM PERIOD OF 6 HOURS.HOPE YOUR GOOD HEALTH. 6 Hours on/off will not comply with rest hours requirements if we take into account hand over period. That is the reason many companies are shifting to 7 hours +5 Hours working arrangements. But of course when we use 6 on/Off, we do not take into account the hand over period while recording rest hours. HI,CAPTAIN.THANKS LOT FOR YOUR REPLY. Good day sir Thank you very much for the rest hour regulation explanations I have a doubt regarding same Officer and crew engaged as a part of first navigational watch and the further watches shall take adequate rest right How much is this adequate amount of rest for this purpose Ia it a complete 6 hour before watch or the normal criteria for daily compliances are enough. Thanks for sharing Rest Hrs Clarification in very simple words. Dear Sir, Excellent explation regarding Work/Rest hours. Easily understood. Thanks a lot. Good day Captain. Why are these requirements different for different conventions? Seajobs are quite tough and taxing. Employees work under stressful conditions and I feel that the workers should have ample hours of rest as per the set organisations schedule. It will enable them to give their best performance for the success of the organisation. Hello, Captain In offshore vessels is very usual the 6/6 watchkeeping, what means 12 work hours a day, everyday during 28 days (in Brazil). 7x12=84 hours. But the Regulations says that cannot have more than 72 work hours in any period of 7 days! How is this accepted so naturally worldwide? How to split minutes in working and rest hour in watchkeeper client3, Example if i work from 08:00 to 12:10, then it working hour is 08:00 to 12:00 or 08:00 to 12:30?